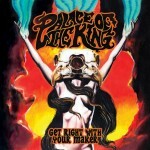 Share the post "Album review: PALACE OF THE KING – Get It Right With Your Maker"
On the first listen to Get Right With Your Maker, the latest album from Australia’s Palace of The King, I was indifferent to be honest. However, two or three listens later I was hooked. The comparisons to Rival Sons, The Answer and Wolfmother are easy to make as you’ll be reminded of all three at one point or another, but don’t be fooled, this album is a tasty slab of blues and funk infused straight ahead rock. Opening track, and earlier single, ‘I Am The Storm’ finds singer/guitarist Tim Henwood coming over like a soulful preacher from deep down south (that is USA and not Bournemouth!! ), then we are straight into the big sound and solid guitars of ‘It’s Been A Long Time Coming’, which is probably my favourite track on the album, although it’s a close run thing between this and ‘Back On My Feet Again’, the former of the two with a firm nod to fellow Aussies AC/DC. The soul/funk vibe is at the fore on tracks ‘Sold Me Down The River’ and ‘Dog With A Bone’, whilst at the other end of the spectrum there is a Black Sabbath feel to ‘Fly Like An Evil’. It is, however, the big solid rock songs that make ‘Get Right With Your Maker’ such a strong album, and Black Crowes like ‘Said The Spider to The Bird’ and ‘The Serpent’ are two more fine examples of this. Also worth a mention is the Led Zep friendly ‘Move Through The Fire’, another track which highlights the song writing quality within Palace of The King. This entry was posted in ALBUM REVIEWS, ALBUM REVIEWS (Mobile), All Posts and tagged album, Get It Right With Your Maker, hard rock, Palace of the King, review, rock. Bookmark the permalink.